It’s time for another Watercooler Wednesday challenge – this time Gail Allen is hosting! 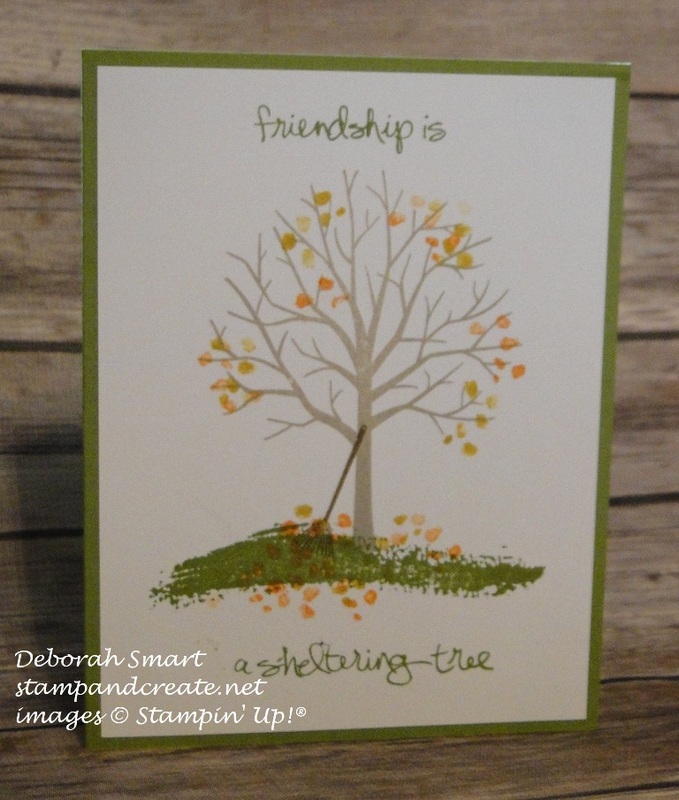 Gail has chosen to do a Simply Stamping challenge, with a Fall theme. In case you haven’t done one of our Simply Stamping challenges before, what it means is that it’s stamping only – no layers, no embellishments or die-cuts; nothing except the simplicity of stamping for the “clean & simple”. Heat embossing is allowed, since if one decides to use a colour, heat embossing would show better than simple stamping, but dry embossing (with embossing folders) is not allowed. Yes, it is different from other challenge sites that call it Clean & Simple, but that’s why we call it ‘simply stamping’. This was my first card which, as you can see, violates our ‘no dry embossing’ rule! Rats!! I really did like the effect of the new Cable Knit Dynamic Textured Embossing Folder! By spritzing the cardstock before embossing, it slightly breaks down the fibres of the cardstock, allowing for an extra deep embossing effect. But – this card doesn’t count, because it’s not within our rules, so it was back to the drawing board for me! Not to worry – I simply re-made the same card as above, but without the extra layers, and the strip of embossing. For the stamping, I started by stamping the grass using Old Olive ink from the Sheltering Tree stamp set, and stamped that across the bottom. Next, I stamped the tree trunk in Crumb Cake ink. I wanted to give the tree a true ‘fall’ look, so I used the small leaf/flower stamp image (I think it does double duty, since it’s a rather indistinct shape), and stamped it first in Pumpkin Pie ink, then randomly in Delightful Dijon ink. I stamped the leaves randomly in the branches, and on the ground around the tree. The sentiment, also from the Sheltering Tree stamp set, was stamped in Old Olive ink. I simply masked off the portions of the stamp, so that I could separate the sentiment and stamp it at the top and bottom of the card front. The stamped panel was then attached to the card base of Old Olive cardstock. So you can see, by these two cards that I made that this is a good way to stamp a ‘basic’ card – no layers, no embellishments; and a ‘stepped up’ version – with the extra layer of cardstock, and the strip of embossed cardstock. You could step it up even more, by heat embossing the leaves, or adding some Enamel Shapes if you wanted. Well, that’s it for me today! I hope you’ve enjoyed my cards 🙂 I’d love to read any comment you’d care to leave. I hope you’ll head over to the Watercooler Challenges blog page, and see what the rest of the Watercooler Artists have created, and then link up your own card for the challenge. Next Next post: I’m Back from the U.K. with Lots to Share! 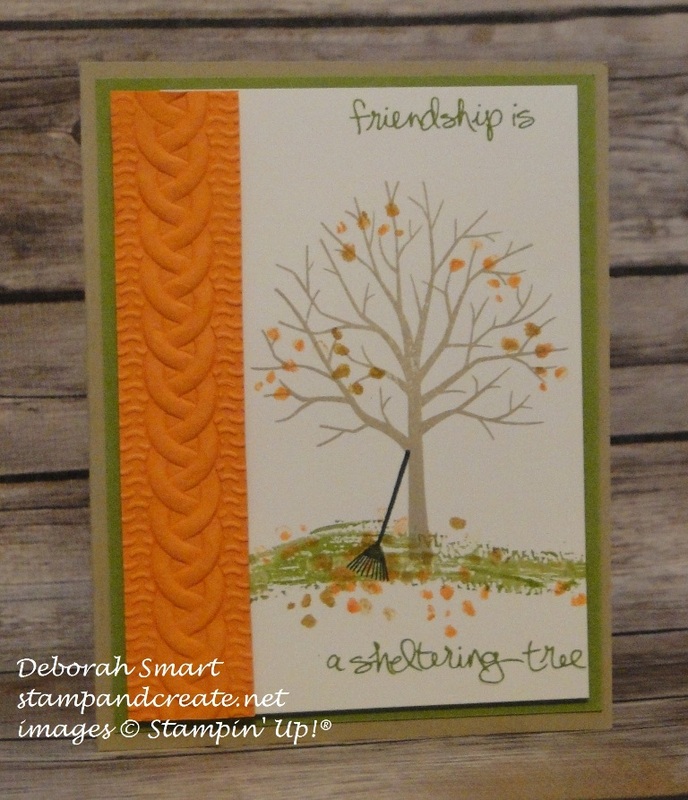 Deb, lovely fall card. I like that strip of cable knit to really bring in the feel of fall. I simply love this card Deb. Well actually I love both versions. You made me re think my need to have the Sheltering Tree set. The addition of the rake and leaves below the tree is priceless. A great card to CASe!